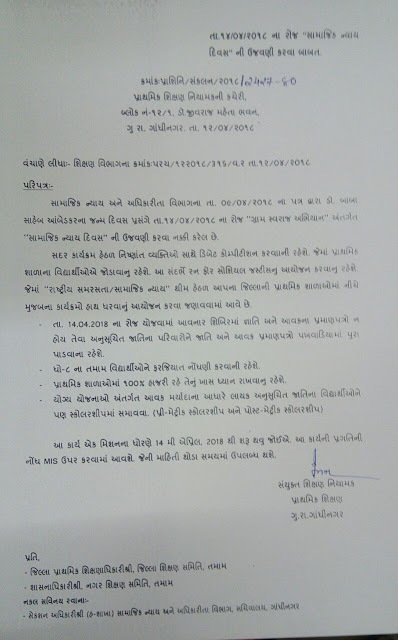 14 APRIL NA ROJ PRIMARY SCHOOL CHALU RAKHAVA BABAT NIYAMAK NO LATEST PARIPATRA. Home » Paripatra » 14 APRIL NA ROJ PRIMARY SCHOOL CHALU RAKHAVA BABAT NIYAMAK NO LATEST PARIPATRA. SAMAJIK NYAY DIVAS NI UJAVANI KARVA BABAT PARIPATRA DATE-12-4-2018.